When the town is adorned with lights at dusk, would you delight in having an after-work drinking with small delicious dishes and tapas for your reward? 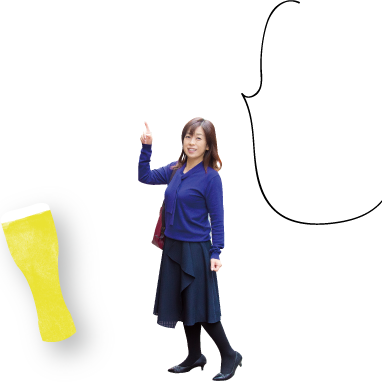 This time, we will go for a drink to very popular local Japanese-style bars and restaurants with a very attractive beautiful woman, Ako-san, who lives in the town. Why don’t we go around? Yakitori, Japan’s popular and budget-friendly skewered chicken. 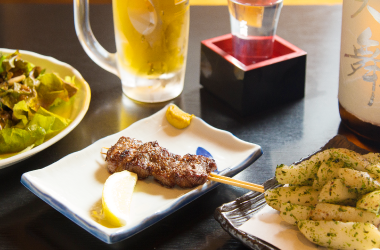 Delicious yakitori makes Japanese sake more luscious! We introduce you some of the best yakitori restaurants in Tachikawa, where you can savor the mouth-watering and roasted flavored yakitori. 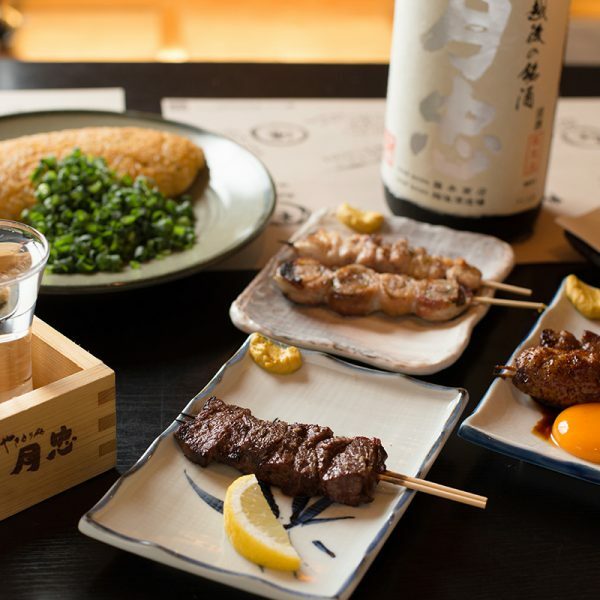 Make a toast with scrumptious Japanese sake and charcoal grilled yakitori. The restaurant prepares safe and fresh meat and vegetables, which are directly delivered by the producers. The meat, dipped into ideal secret Tare (Teriyaki sauce taste), is carefully cooked on a charcoal grill, which turns brown and crispy outside as well as tender and juicy inside. Let’s cheer up with a series of exquisite sake collected from various places across the country! 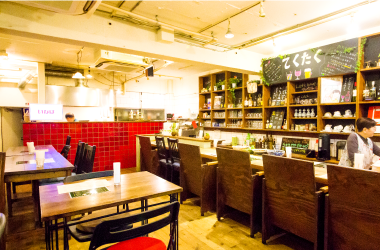 Even a female guest can enjoy solo drink at a counter bar table with a lively conversation with the staff. You will come to like eating liver?! This skewered liver is perfectly grilled! The chef carefully marinates selected entrails before cooking to remove the smell of the liver. He then grills the meat tasty and perfectly. You will profoundly enjoy its mellow flavor and texture. 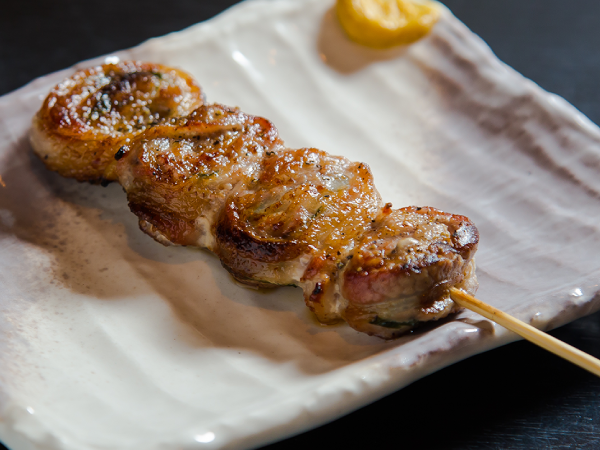 We firmly recommend this skewered liver, especially for those who are not good at eating liver. The chicken, which is wrapped carefully by a slice of pork back ribs, matches well with Shiso (green perilla). Its rich flavor fills your mouth when you eat it. 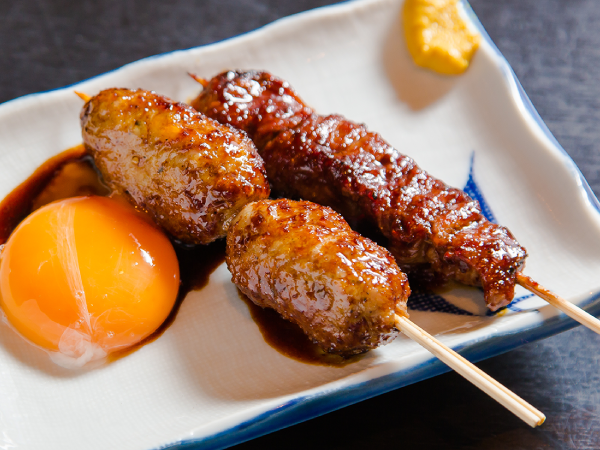 Special home-made Tsukune (chicken meatballs), which is served with an egg yolk, is juicy and has a rich taste. Children like it, too. 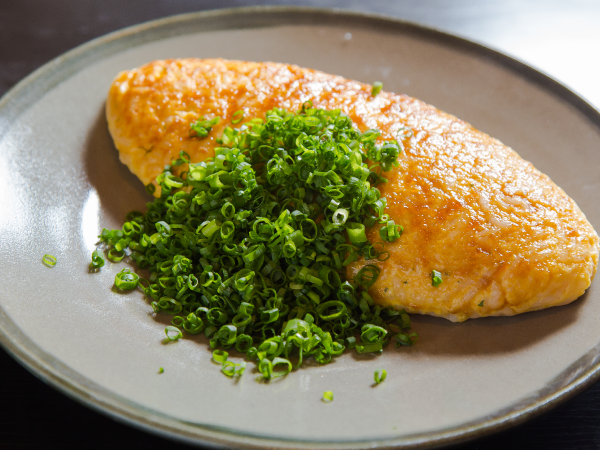 Delicious fluffy omelet with lots of chives is a dish of Japanese-style with no ketchup. Please enjoy this in the end. What is Disco Night in Dive!? The restaurant turns into a disco on every Sundays of even months. This is a popular event which has been held for a decade. All generations from young to middle enjoy dancing under a mirror ball along with exciting songs performed by DJ. 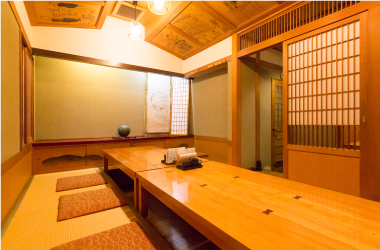 A very warm and cozy Kotatsu room is a suitable place for you to enjoy tasty food and alcohol beverages. Let’s get together in a group or with your family. Enjoy the specialized yakitori that matches with Japanese sake and wine in a modern Japanese atmosphere. Step into the restaurant full of smile and joy at the bar counter tables which you can look through an antique glass door. In a clean and beautiful cooking area the chef and stuff serve delicious and tasty yakitori for customers. 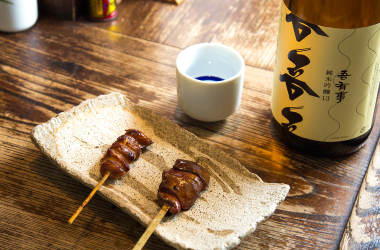 Have some tasty yakitori with salts made in Amami Oshima, an island in the South of Japan. Have a just-grilled yakitori on a counter bar table! 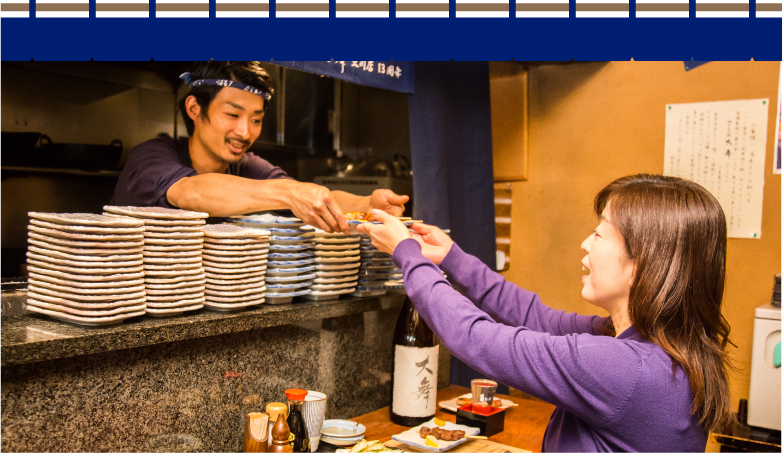 Real experienced adults relish a specialized yakitori one by one at its owned-established counter. 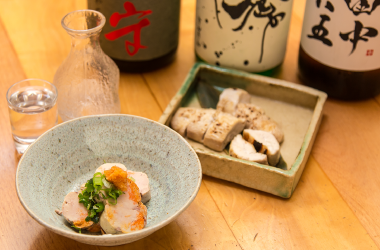 Enjoy aromatic flavorful sake while you wait for another yakitori grilled up. 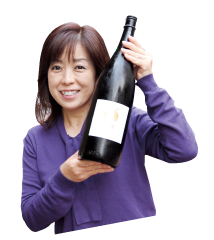 Sake will be changed seasonally. Ask the staff the today’s special. Deep fried tofu with sweet shirodashi flavored (white soy sauce) turnip sauce has very elegant taste. 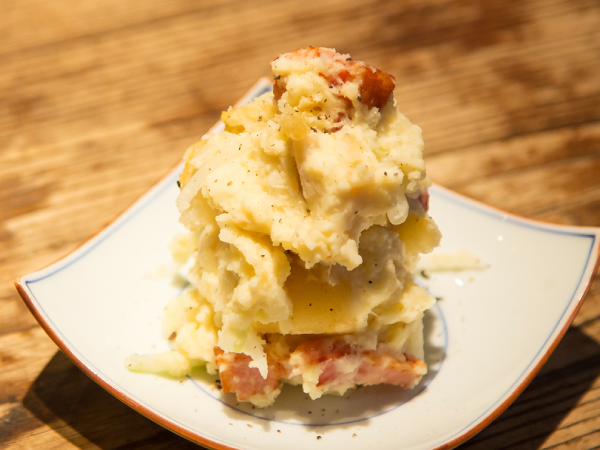 Rich flavored potato salad with good texture is also decorated beautifully. You can’t stop eating. Slurp fatty chicken stock soup noodle in the end of the cold winter night warms your body. 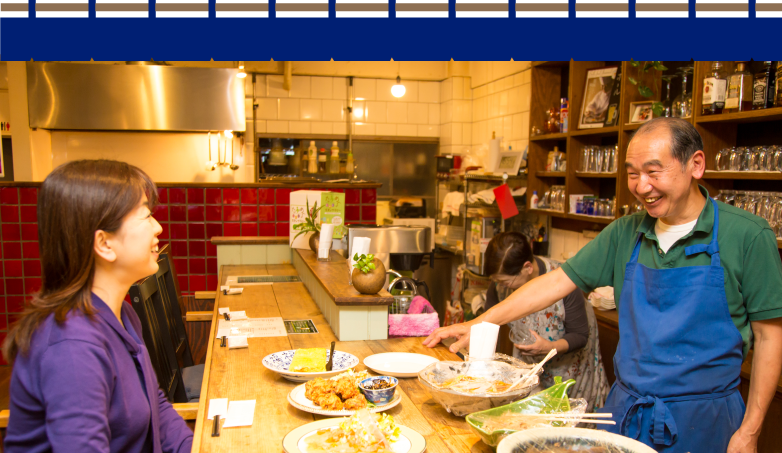 Even if you visit the place for the first time, you will enjoy warm-hearted conversation with the restaurant’s friendly staff. Of course, frequent guests are always welcomed! 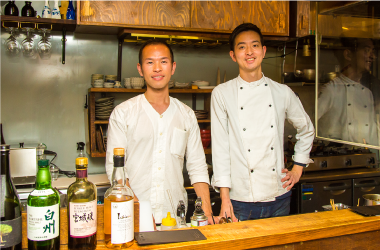 The staff’s familiar and friendly services attract many customers who visit the restaurant for the first time and they tend to come alone to have a drink comfortably. Sometimes customers sitting beside each other start talking. 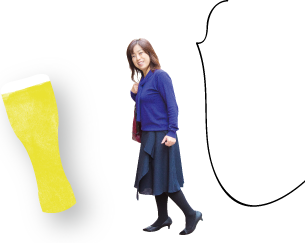 “Let’s drink together.” said the shop’s manager, Mr. Kunitaka Otsubo with a lively smile, and his partner, Mr. Takanori Kaneya. Stylish atmosphere matches women, couples, and families. A restaurant, a renovation of an old house, has warm and sophisticated atmosphere so that all the customers such as women and couples can have a relaxing time in its elegant and cozy mood. There are table seats at the back for family and big groups. Smoking is banned in the restaurant so that children and old-aged people can also enjoy the mood. 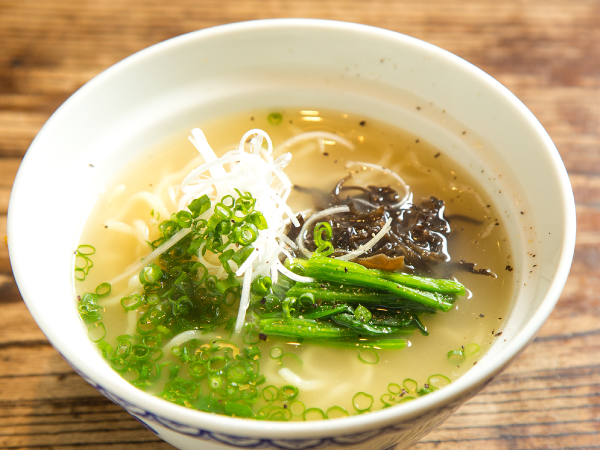 Enjoy the marriage between Japanese cuisine and sake. 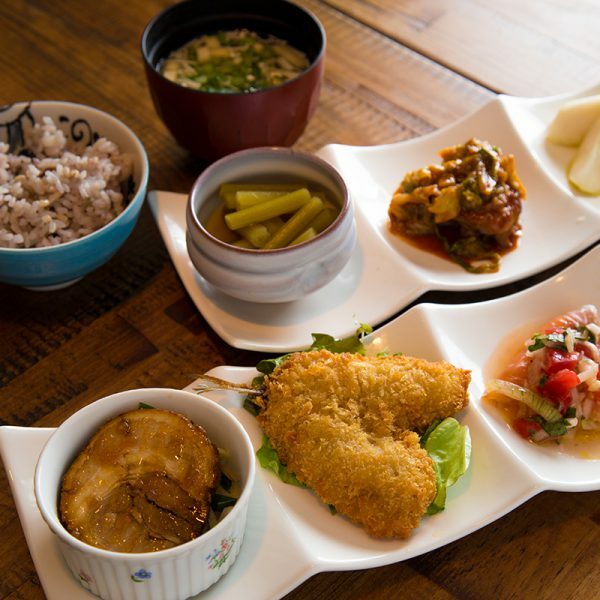 Spend a marvelous time with Japanese sake and a variety of splendid Japanese cuisine. 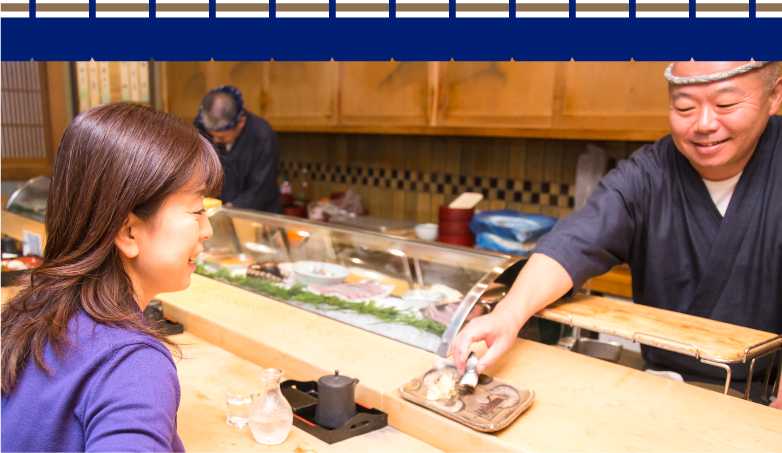 Rejoice to eat scrumptious sushi prepared by a skillful sushi chef. 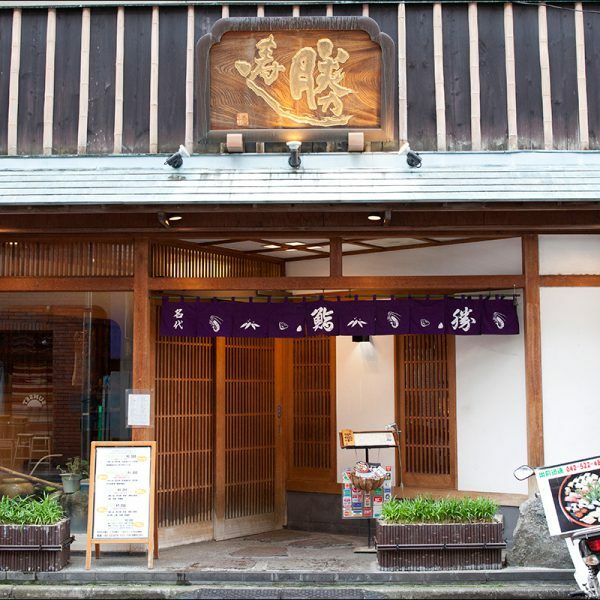 This is the sushi restaurant that has the longest history in Tachikawa. 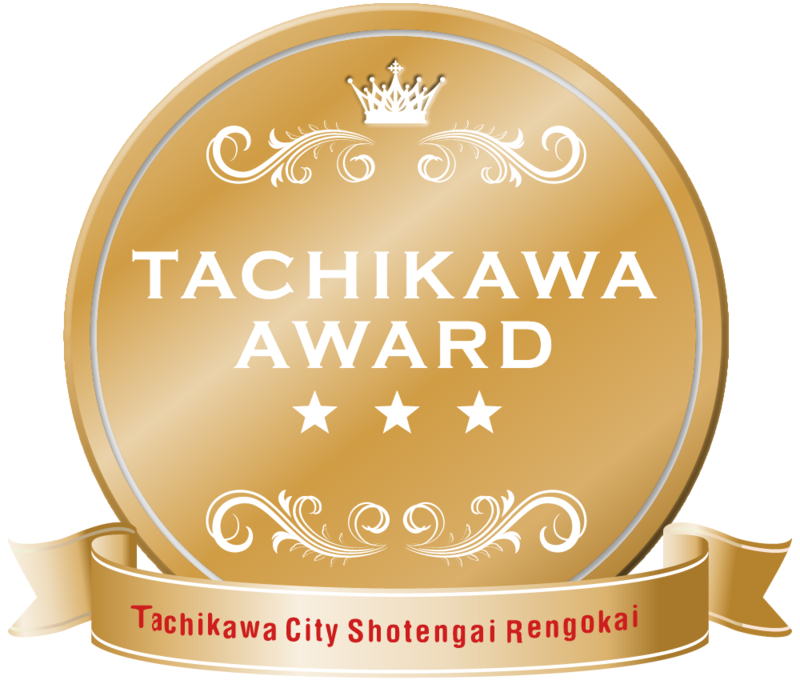 This is a very popular and long-established local sushi restaurant in Tachikawa. 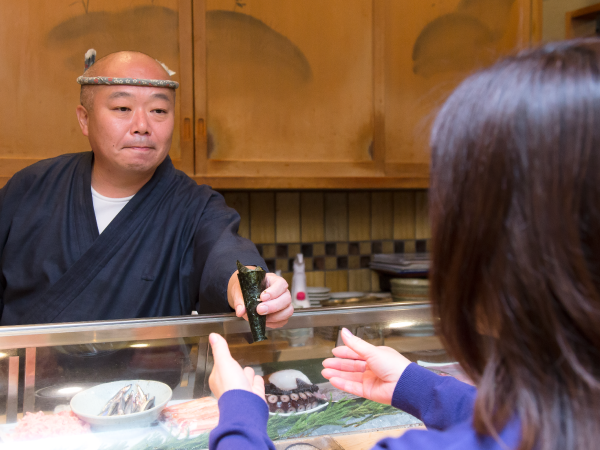 Every morning the restaurant’s owner, Mr. Eiichi Yoshimoto goes to fish markets to buy fresh fish (sushi topping). Some extra efforts such as marinating sushi neta (sushi topping) with vinegar and salt, and simmering and grilling before making delicious sushi make his sushi a kind of art work. You can enjoy local scrumptious sake. The brand changes every month according to the kinds of seafood. Relish rich and melty cuisine of grilled monkfish liver and soft roe, which especially taste good in winter. Spacious private rooms are suitable for year-end and new-year parties. 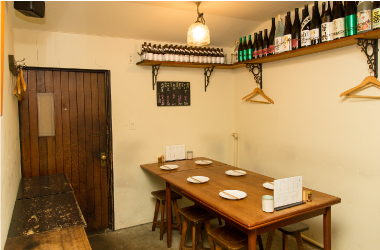 Several types of private rooms are available for the parties with many guests. 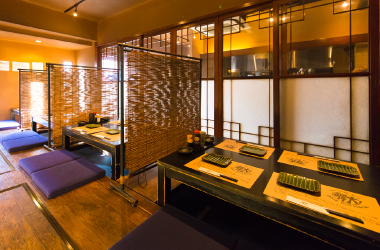 Spend a cherish time with luscious sushi and sake in a Kotatsu room. 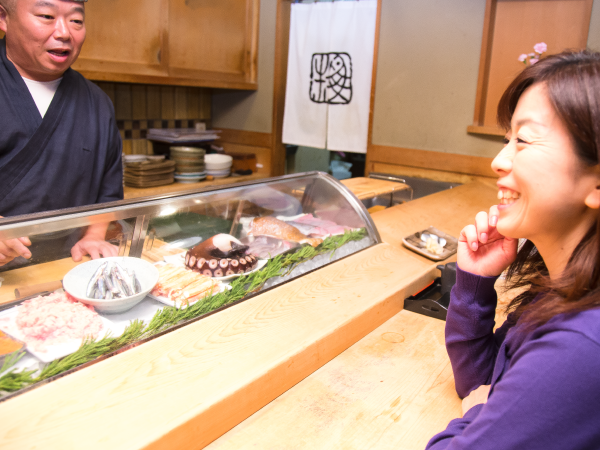 Have a precious time to eat sushi at real authentic sushi restaurant,not Kaitenzushi (conveyor belt sushi)! 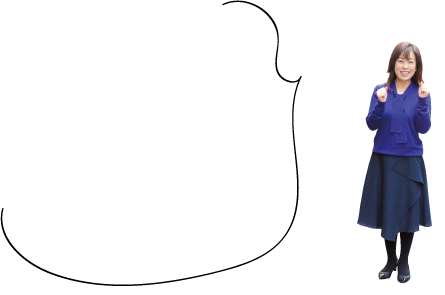 Starting with plain taste of sushi-neta (ingredients used for fillings and toppings), and then later eating something more rich or fatty is a recommended way of eating sushi. Please try seasonal sushi-neta, and have a roll of sushi in the end. 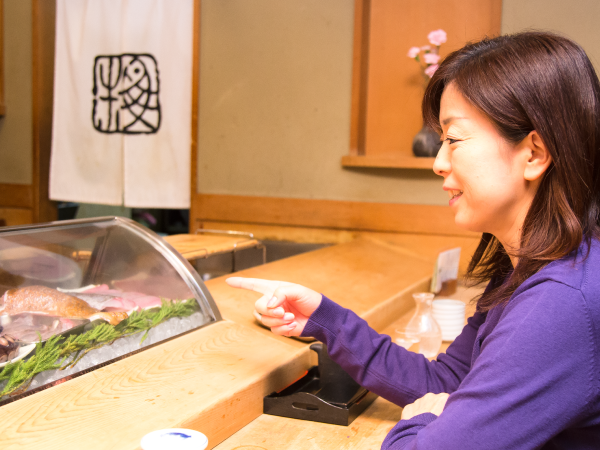 Having a chat with a master is one of the pleasant time oat a sushi counter. Ask him the specialties of the day and delicious combination of the cuisine. 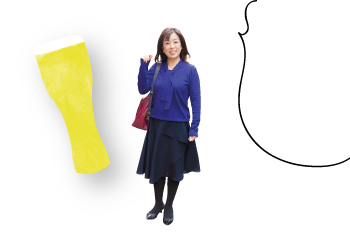 Find a suitable restaurant for you when you drink alone for the first time. Going for a drink alone seems to be excited, but little bit thrilling…. For the beginners, we will recommend a perfect comfortable place. 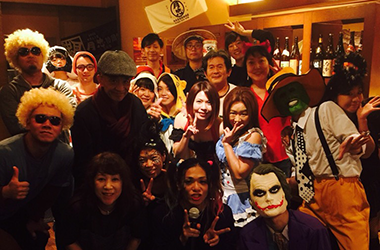 The restaurant owner will welcome you with a smile to the warm and home-like atmosphere. There is a stylish and attractive cafe restaurant at the corner of the apartments on the street with super markets and stores. The neighbors and college students nearby are drawn into the cozy place. Music performance of the piano and the harp is held sometimes. Take a break with a couple of drinks and home-made food. 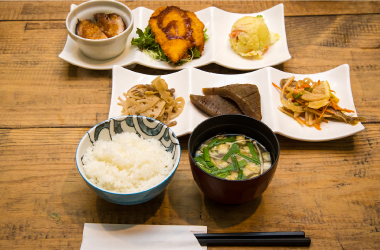 If you are hungry, have a set meal of Obanzai (a side-dish of Kyoto), which includes six kinds of healthy and nutritious tasty small dishes. Beers, wines, and other alcohol beverages are prepared as well. 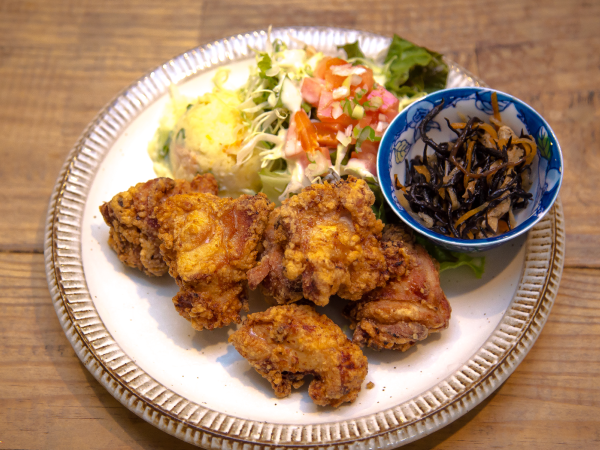 A plate of crispy and delicious fried chicken, which matches a glass of beer and small dishes, will surely satisfy you! 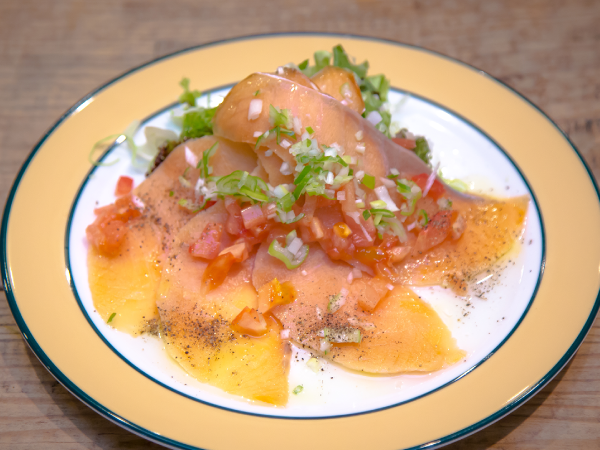 Delicious salmon carpaccio matches with a glass of cold dry wine very well, tempting you to have another glass. 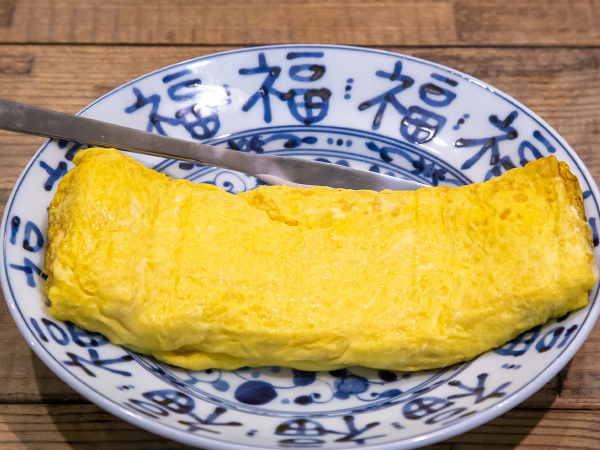 Scrumptious Japanese-style soft omelette, the specialty of the restaurant, cooked by a master who has been a chef in Ueno Seiyoken, one of Tokyo’s first western-style restaurant. You will be delighted to see warm smiles of the master and his wife. 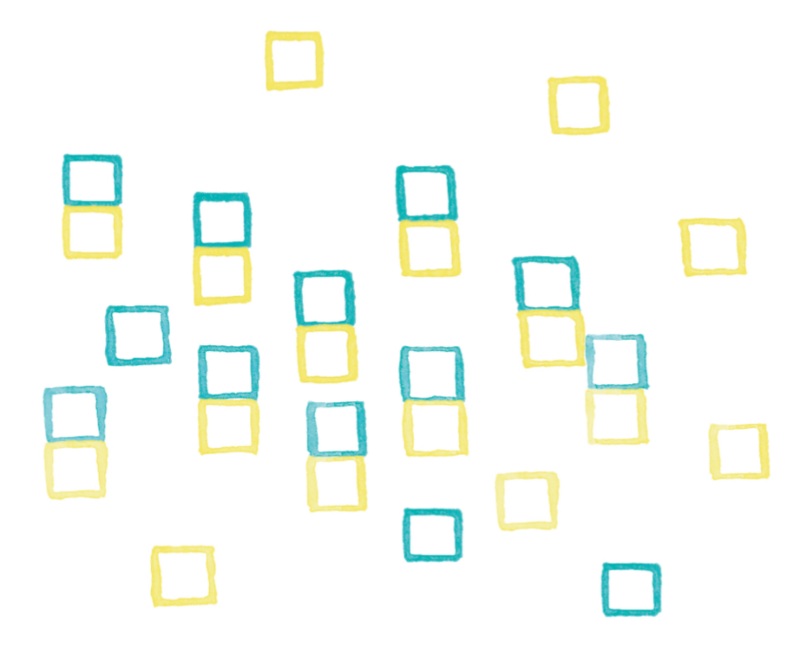 You will feel as if you are at home. 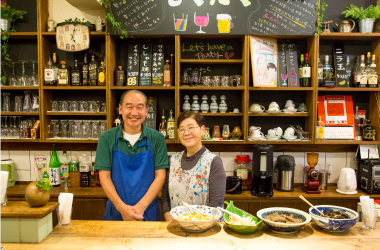 Mr. and Mrs. Sato, the owners of the restaurant, want the neighbors to visit here frequently. 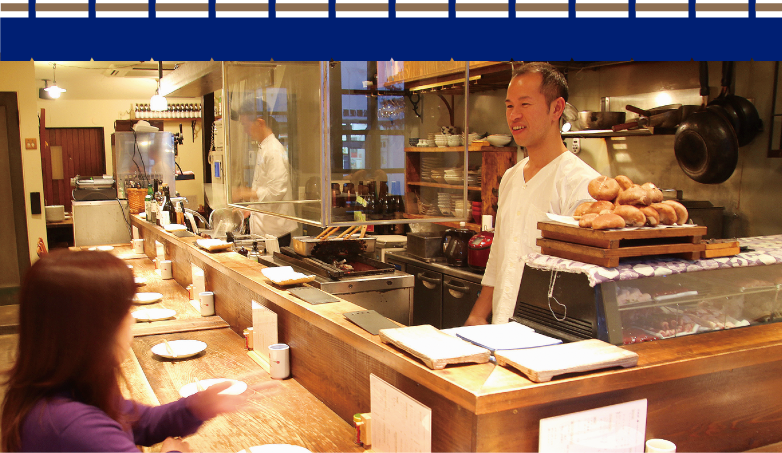 Those who visit the restaurant, getting relaxed to see their warm smile, will want to stay longer. Sometimes they stop by to enjoy their drinks alone. This is the place that Kitori showroom and factory, a famous architecture design company, has produced. 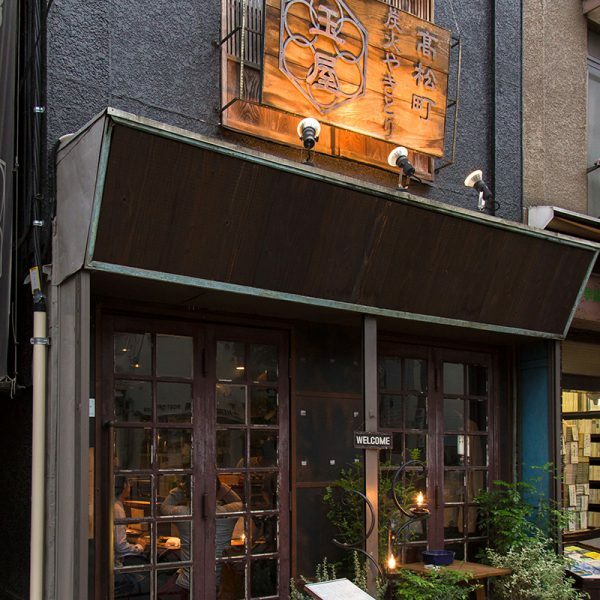 Kitori, a very popular with its creative design, carefully created an atmosphere for the restaurant to make eye contacts with the customers sitting on the counter table. It’s very good to have a drink alone. I enjoyed talking with the chefs and owners of the restaurant.